Once again, we have reached Biur Chometz time! In previous years, Hatzala Beit Shemesh has been called to burn cases where children and even adults have been burned, in some cases seriously. 1. DO NOT EVER!!! place lighter fluid or other chemicals on a raging fire. We’ll repeat it again: DO NOT EVER!!! place lighter fluid or other chemicals on a raging fire. A number of years ago, a man and his grandson were seriously injured as they walked near a fire, where children were spraying chemicals on the fire. To this day, they are still dealing with the after effects of this terrible tragedy. 2. Children should NEVER start or be left alone by a fire, without proper adult supervision. 3. 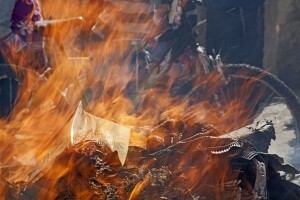 Plastics and other non-combustible items should not be thrown in the fire. This can cause breathing difficulties. 4. Never, ever thrown a aerosol can or sealed bottle in the fire! The can can explode, sending shrapnel and shards into the crowd – and leaving people with injuries similar to a bomb blast! Some quick burn tips: If, Chas V’Shalom, someone does get a burn, taking these immediate steps will alleviate some of the pain and time of healing. B. Immediately remove whatever clothing is covering the burned area. However: DO NOT PEEL OFF CLOTHING WHICH IS STUCK TO THE SKIN! C. Place the burned area under cool, but not cold, water until responders arrive on the scene. D. Remove any rings, bracelets, or other tight fitting jewelry or body ornaments, as swelling may occur. E. DO NOT put any lotions, salves, or creams on the burn without speaking to a medical professional, such as a doctor. These items can trap in the heat, and create more complications to healing. We hope these safety tips keep you and your children safe, so you do not need to call us for a burn! Wishing everyone a Chag Kosher V’Sameach and a very safe and happy Yom Tov! This entry was tagged chometz, israel, pesach. Bookmark the permalink. ← Mazel Tov to our Non-Explosive Purim Raffle winner!